One night while Chris and I were getting ready for bed in December he made a crack that he thought the baby should have an outfit with a big picture of his face on it. If only he knew what Santa was already planning on brining him! I’ve decided to do a post on Onesies (or in this case a baby T-shirt) for the next 6 weeks which should lead me right up to baby arrival time. 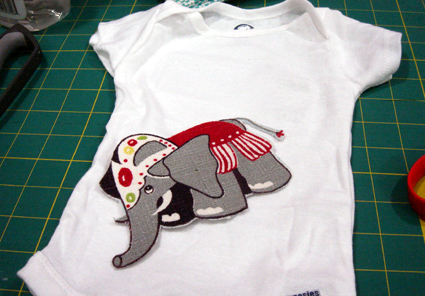 Keep in mind with each of these crafty how-to projects that they work for adult clothes as well as baby clothes (just check out my applique idol Aorta for proof). 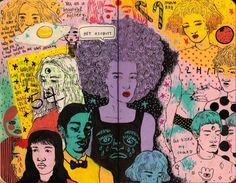 So if the thought of kids makes you gag like it did me not so very long ago you could easily use the idea in this project to appliqué your favorite jean jacket, hoodie, skirt – you name it. I have to say that as always my mother came in mighty handy with this project. That Fredda Perkins is a wiz with the fabrics and sewing machine. 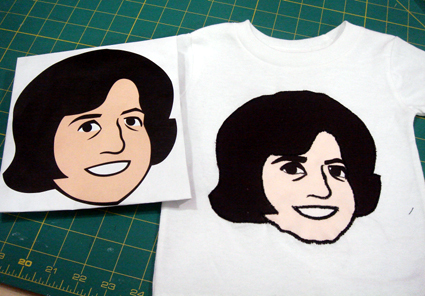 I made this T-shirt when I was up visiting my parents as I needed it to be a stealth project since it was a surprise for Chris. As you can see from the picture of him on Christmas day holding up the finished project, surprised he was! Also my copy of Complete Embellishing by Kayte Terry was quite useful with all her applique tutorials. First I started with a logo for his band that our friend Jeff Conway had designed. 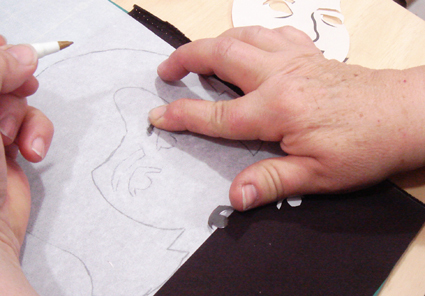 I always loved this illustration of Chris and thought it would be easy to transform into an appliqué. 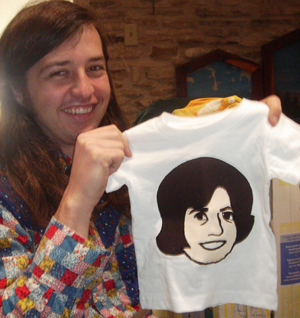 1)I altered my image on the computer to make the image of Chris’s face the same size as the T-shirt. 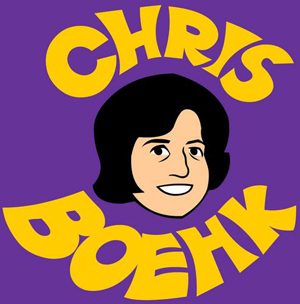 I also got rid of the text that said Chris Boehk. I printed several copies of the image out onto printer paper. 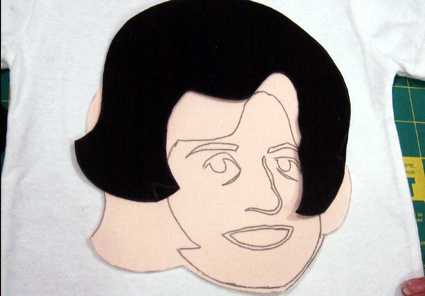 3)Cut apart the parts of Chris’s head like his hair, eyes and mouth. 4)Stick your Steam a Seam to the back of the flesh colored fabric. 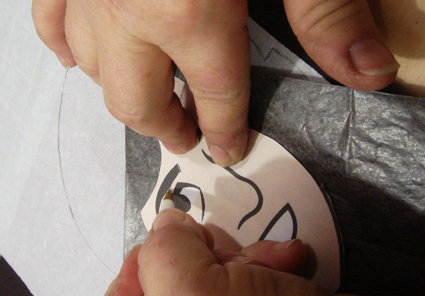 Then using artist tracing paper, trace the facial features onto the front side of the fabric. 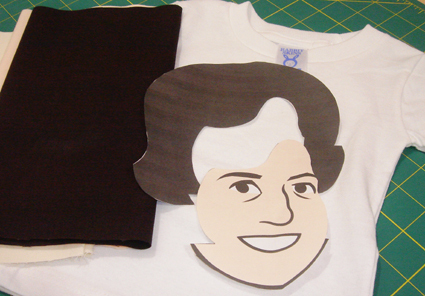 5)Once you have finished cut out the whole head shape in the flesh colored fabric. The head should have all the features traced onto it. 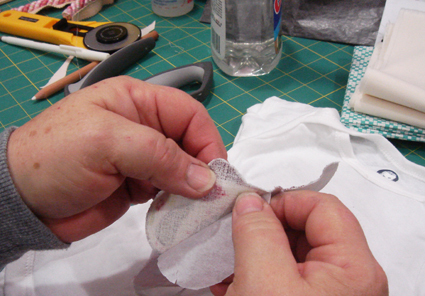 6)Attach the sticky side of the Steam a Seam to the brown fabric you are using for hair and eyebrows. 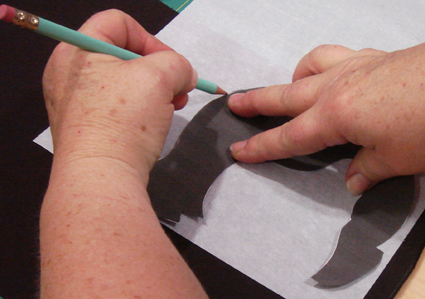 Trace the pattern for the hair onto the Steam a Seam sheet (with the protective paper still on the side you are tracing). 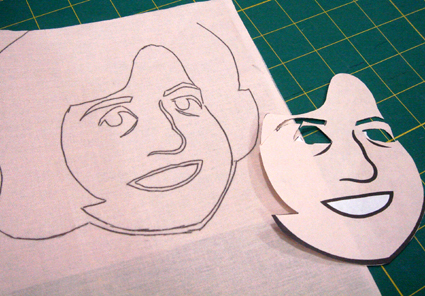 7)Do the same thing and make an applique out of white fabric for the mouth and eyes. 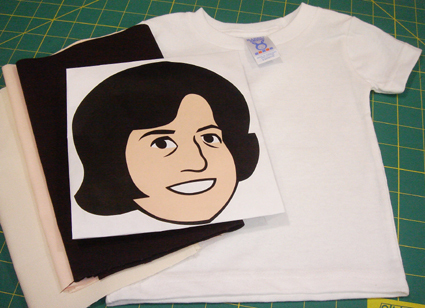 8)Remove the protective paper from the back of the flesh colored face and stick that piece onto the T-shirt. The fusible product is sticky enough to hold the pieces together with out pressing but it can still be peeled up and moved around if need be. When you are happy with the placement of the piece iron it to the shirt following the manufacturer’s directions. Peel the protective paper from the back of the hair and stick it in it’s place over the flesh colored fabric. Same with the eyes and eyebrows and the white mouth. Following the manufacturer’s directions, iron the facial features permanently in place. 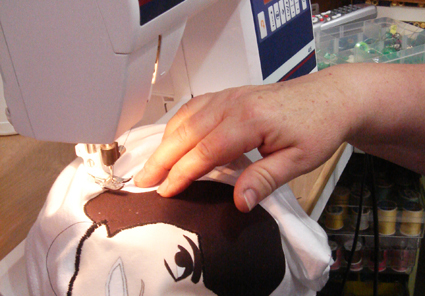 9)With dark brown thread use the satin stitch on your sewing machine to outline all around the head. 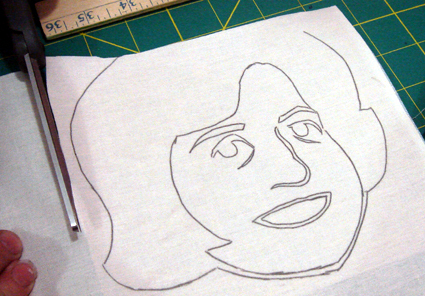 Next outline the mouth, nose, and the lines under the eyes. As an alternative, you could just sew a straight stitch to out line the head then hand embroider the eye lines, nose and mouth with black embroidery thread using a satin stitch. The finished project is a doppelganger for the original picture and Chris’s wish came true now the baby has a shirt with a big picture of his face on it. No questioning who the baby daddy is. 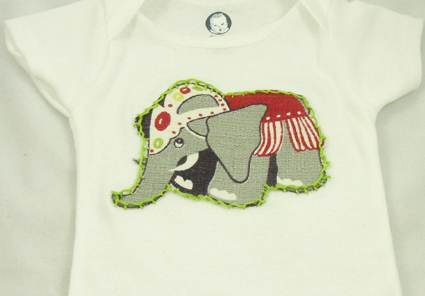 Another appliqué alternative is using a pre-existing image on fabric. 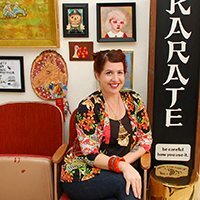 My mother happens to hoard Barkcloth and lucky for me has tons in the juvenile variety that make perfect little appliqués like circus elephants, cowboys, kittens and more! First things first select the graphic you would like to use. Peel off one side of the backing of the Steam a Seam and attach to fabric then cut out the shape. Next decide on the placement of your appliqué. Peel backing off of Steam a Seam and iron on to set permanently. You can do a decorative embroidery stitch around the edges if it tickles your fancy. 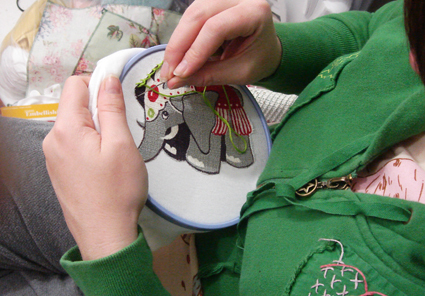 We opted for a lime green blanket stitch around the edges of the elephant. The finished product is pretty a-doorbell if I do say so myself. Look for fun designs on sheets, towels and more! Be sure to tune in for the next several Fridays as we continue the onesie party with embroidery, stencils, iron-ons and more! Posted January 23, 2009 & filed under Crafts, Crafty, Kids, Needle Arts. 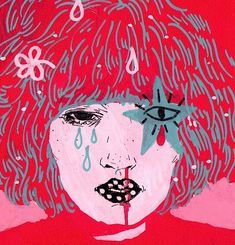 I didn’t give you permission to use my likeness for this blog. Cute, thanks for sharing the information. Congratulations, Jennifer!! Deco-ing onesies will help pass the time!! I did the exact same thing. I get to see our other preggy ACM friend this weekend!! I *heart* those so much, it hurts! Oh this is beyond fun! I love it! Thanks so much for the how-to, I’ll be linking. Dang girlie! I've taught this technique in a few classes, but dreaded writing it out to blog … mind if I just send folks over here instead????? Crafty love to the little peanut. 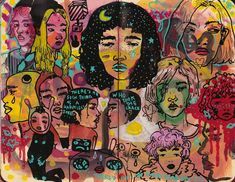 omg, you rule. i was just thinking about Stitch and decided to check out your blog as i haven’t read it in awhile. anywho, i’ve been sitting here browsing through and was pleasantly surprised to see my name. you’re a peach and congratulations on the baby! 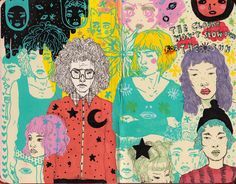 It's so cute.I am from turkey and ı loved your style.I'm a new blogger and your ıdeas are perfect for me.Thank you.